The CI-5LB is a high resolution active computer video interface with an HD-15 computer video input and a fully buffered HD-15 local monitor "loop through" output. allowing cable runs of up to 200 feet. The PCI-5 offers a passive interface for HD-15 computer video and a mini stereo audio jack in a convenient Decora style wallplate. 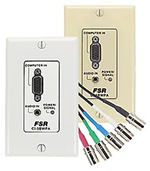 The VWP-SVA is a Composite, S-Video and Stereo Audio interface that fits in a single gang Decora style wall plate. The VIP-100 is a two gang Decora wallplate containing a CI–5BWPA computer video with stereo audio interface and a VWP-SVA S-video/Composite video with stereo audio interface.